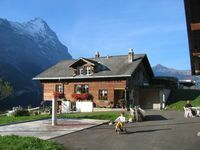 Property 4: Top location for all activities in and around Grindelwald! Property 34: Holiday-Apartment in Swiss chalet, in the valley of waterfalls. 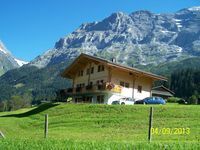 Property 49: family-friendly apartment near Spiez u. Interlaken, max. 4 Ext. / 1 ​​Ki. Beautiful chalet! Will definitely be back! We enjoyed a wonderful stay at the Steuri chalet. It is in a beautiful location with amazing views right from the balcony. It is in a perfect location for hiking, skiing, or just relaxing! The Jungfrau Top of Europe excursion is also easily accessible - and well worth it!. Walter kindly picked us up at the train station and then we used the bus to get in and out of Grindewald throughout our stay which stops a few steps outside the apartment. The welcome basket was very kind - the cheese and eggs were delicious and were farm fresh! I highly recommend this place.